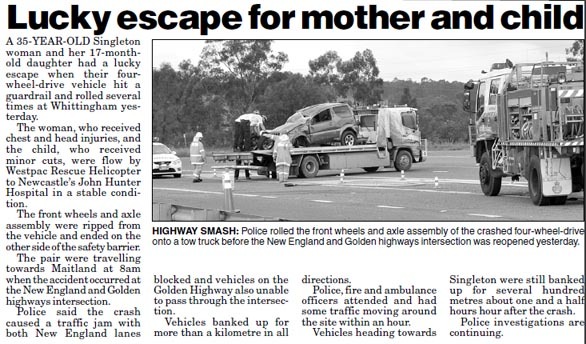 Above: Report from the Singleton Argus, 8th October 2011. The Jimny hit a guardrail at 100km/hr, flipped and rolled multiple times before stopping right-side-up in the middle of the road. I was trapped in the car, looking at the roof and shattered (but still holding) windscreen glass. My baby was screaming and crying in her capsule, arms and legs flailing. I tried to comfort her but I couldn't even speak - I could only watch her distress. Kind strangers got her out and laid her on top of me for comfort, which worked, and the ambulance cut me out of the car. I had bruises and cuts, my baby had a graze on her left temple – I presume from a toy that had flown around in the accident. We were lucky to get away with only bruises and grazes. The Jimny’s front axle came off, the front wheels ended up in the paddock over the guardrail. The front cabin was smashed in. Apparently the roof and windscreen were touching the steering wheel. The rear cabin was almost untouched, and looking from behind, the Jimny looked as it normally did. When you look at the pictures above, you’ll be amazed that we both just walked away. I do think of that Jimny as a hero. Why did I crash? I was preoccupied with my daughter’s sippy cup and wasn’t paying attention to driving. Since the crash I have had many parents tell me that they also get distracted by their children, and that the accident has been a cautionary tale for them. It's actually scary how common it is to be distracted (or let yourself be distracted) by your children. I used to say that a positive about the Jimny's size was that you could reach the baby from the front - and now I've amended that statement to say that only a front passenger should be able to be distracted to do that. I learned the hard way that when driving, and in fact in most areas of life, I need to be fully focussed on the task at hand. Fully focussed in reality and in the 'now'. If I had the last 6 years again, would I still own that Jimny? You bet. But although I walked away, it does bother me that the airbags never deployed. But don't get me wrong - I'm a very grateful person. Nevertheless I’ve had discussions with people who say that it wasn’t a front on collision, or that airbags need a really hard knock to get going (is a multiple rollover not a hard knock?). What do you think? Judge for yourself. 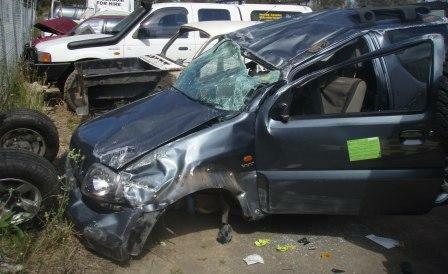 really glad you're both OK, I love my 2007 Jimny but it does highlight one's vulnerability especially with the hit'n'miss airbag system - wonder if they'd go-off with a full roll-cage and steel bumpers ? Yes I would have thought the airbags would be more sensitive than the 'quick-release' front axle (as mentioned by a friend of Nigel)! Still love the Jimny though. We got away scot-free. I'm shocked, so shocked, I can't believe it! So glad you're OK.
im so glad your ok how is the baby now? well not a baby but how the girl now? those air bags stink they don't help for anything. Air bags shouldn't go off unless you're in a square, front on collision, the 'crush can' to set off the airbags is behind the front bumper and must be hit quite hard to deploy them. you can really see where the rollover hoop stopped the middle of the cab being crushed. You're luck to be ok! Enough to not let it happen again anyway! No liability or responsibility is accepted for the information on this website. Click to view our disclaimer.